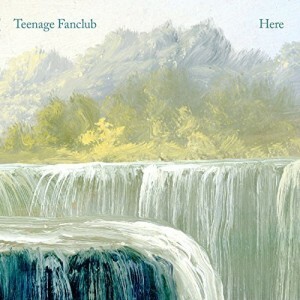 Making it look easy, Scotland’s alt-rock melody-makers Teenage Fanclub produce seamless breezes filled with quiet yearning and stern, rock-solid solace. Nostalgic romantics whose cherished harmonies flow with pleasing expediency, the five-piece league of gentlemen coast on dreamy beds of gurgling guitars whose occasionally fitful backlashes strengthen each song’s faith and convictions. From the waterfall cover art to the Zen song titles, “Here,” focuses on life’s ubiquitous transience; wrapping unsettled uncertainties around searching hearts through plainspoken lyrics rolling in consoling, cajoling sympathies. Whether reflecting on wisdom gained from days gone by or simply pondering unformed futures, the band’s unerring ear for nuanced chord progressions make well-feathered nests for lovesick songbirds. In a rare convergence of good fortune, Teenage Fan club plays Madison’s High Noon Saloon October 23rd with Sam Evian.